Research on dolphin intelligence provides valuable information that reveals the reasons for their particular behavior. These cetaceans can perform unusual activities within the animal world and perform complex actions. Most dolphins are active during the 24 hours, both day and night although they are mainly active during the morning and afternoon. Everything they do during the day depends on the conditions of their habitat, the season of the year (breeding season, mating, etc. ), the time of the day and the physiological conditions of their bodies. There was a general uncertainty about the way dolphins sleep, but after several studies, it became evident that they do sleep but not the way humans do. Since they need some degree of consciousness to reach the surface and breathe, they keep one cerebral hemisphere active while the other rests. However, dolphins in captivity have an entirely different resting behavior than wild dolphins as they keep their blowhole off the water and do not respond to light stimuli, apparently having a deeper sleep, perhaps because they are not concerned about predators in their tanks that could threaten them. One unusual behavior is when they do a sort of “a cough,” throwing their food out. The case of the Indus river dolphin (Platanista gangetica minor) is particular because of its habitat; the river full of dangerous materials, muddy waters and strong currents, allow this dolphin to rest only 4-60 minutes in short bursts throughout the day. Some species move from one place to another in an almost straight direction. They can travel alone or in the company of other individuals, swimming on the surface of the water to save the energy produced by the friction of the water on the submerged body, to orient themselves better or to get rid of the parasites in their skin. If they are resting, they group tightly and surface often to breathe. The feeding activities can be carried out individually or in groups, cooperating with each other to capture larger prey and having less energy expenditure. One unusual behavior is when they do a sort of “a cough,” throwing their food out. The dolphins of Shark Bay, Australia, have demonstrated to the astonished researchers that they have traits of a culture development, understanding this as a set of knowledge, ideas, beliefs, customs, and practices learned in a society and transmitted from generation to generation. This conclusion was the result of watching these cetaceans protecting their “snout” from rough surfaces with marine sponges, and later their offspring also did this; a behavior that was not inherited but transmitted from parents to their offspring. Dolphins are very curious and enjoy playing with objects and other dolphins. They jump up to 4.9 meters above the surface of the water falling on their backs or with their belly down. They often follow the waves of the stern or the bow of boats. They jump up to 4.9 meters above the surface of the water. Most dolphins play chasing one another, using objects and passing them on to others for attention. They commonly make bubbles in the water and take the time to recreate themselves in the ocean. Occasionally, this playful behavior includes other species of dolphins and animals such as Risso dolphins (Grampus griseus), Pantropical spotted dolphins (Stenella attenuata), pilot whales (Globicephala) and humpback whales (Megaptera novaeangliae). Other games are only fun for them; they have been seen catching birds and submerging them several meters down, without eating them later. The habitat of dolphins also has a lot of dangers. If they notice something unpleasant near the pod, they quickly react swimming to the surface, exhaling, striking the water with their tail and grouping very close to each other. Any external element that disturbs dolphins has negative consequences that include stress, wounds, abnormal migrations and even less reproductive success. Adult males swim in the perimeter of the pod territory to monitor the environment and to communicate others the presence of danger if something happens. Usually, dolphins avoid sharks or flee if they are in the proximity, but there are cases in which these cetaceans have attacked and killed sharks. Normally, dolphins avoid sharks or flee if they are near, but if necessary, they know how to defend from them. 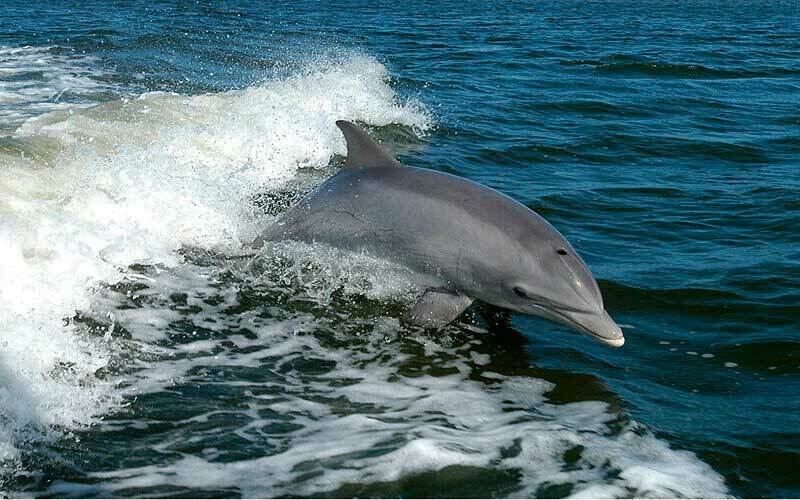 The sociability of dolphins is evident due to their continuous association with other dolphins of the same species and occasionally interactions even with other species of cetaceans and animals in general. If there is something for which people recognize dolphins, it is because of its charming “personality.” Docile and friendly to the human presence, they are also close with their companions. They establish strong social ties, assist wounded dolphins, cooperate to feed themselves and survive, and even voluntarily approach divers and bathers. Did you know that there are unconfirmed reports of dolphins helping humans to fish and sometimes they even offer them fish, octopus, and squid as gifts? Ronald Schusterman, J. A. Thomas, F. G. Wood. Dolphin Cognition and Behavior: A Comparative Approach. Psychology Press, 2013. Dr. Denise L. Herzing. Dolphin Diaries: My 25 Years with Spotted Dolphins in the Bahamas. St. Martin’s Press, 2011.